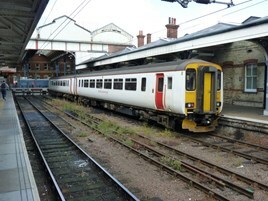 As this issue of RAIL went to press, trains had not run between Marks Tey and Sudbury for a week because of a shortage of available Abellio Greater Anglia diesel multiple units. Trains have also been cancelled for a similar period on the Felixstowe branch. Buses have replaced trains on both routes. “The problems are due to some of our diesel trains suffering wheel damage as a result of poor rail conditions,” said AGA spokesman Lucy Wright. DMUs usually have their tyres turned at Ilford, but because of capacity constraints they have also been visiting Derby Etches Park. On November 11, of the 26 DMUs 11 were out of traffic. Various routes in Norfolk, Suffolk and Cambridgeshire had trains cancelled. Routes in Norfolk, Suffolk and Cambridgeshire had trains cancelled. AGA has been forced to hire DMUs from East Midlands Trains, while its hired rake of Mk 2s and Class 37s from Direct Rail Services has been pressed into more work than booked, to cover for unavailable DMUs. Wright said: “We are doing everything possible to repair the trains affected as fast as we can, including sending trains to other locations with spare capacity for wheel repairs - to speed up the process of returning trains back into service - and seeking to hire additional trains temporarily, although other train operators are suffering similar problems, so we have not yet succeeded. AGA’s DMU fleet contains five single-car Class 153s, nine two-car Class 156s, four two-car Class 170/2s and eight three-car Class 170/2s. The drivers need to explain what they are doing. Or is it Network Fail, again? It will be better off to use the Class 230 D-Train DEMU for the Marks Tey-Sudbury line once they are in public use after being converted because some of the Class 230 D-Trains could be used on the Norwich-Sheringham & Cromer line and Ipswich-Felixstowe line in East Anglia as well the Marks Tey-Sudbury line and the rest of the Class 230's to be used in the North of England and Southwest England to replace the Class 142, Class 143 and Class 144 Pacer DMU trains. There are always leaves in autumn! It seems to me this might all be about saving money. If there were real cost penalties for running alternative buses in circumstances such as this I am sure contingency arrangements for enough trains would be provided. There is a far bigger story here than meets the eye. Although other areas have suffered some of these problems none has been anywhere near as bad as AGA with whole routes closing for weeks. And still the chaos continues. Rail there is a bigger story here for you to investigate. AGA is riddled with management structural defects. I agree. RAIL could do more about East Anglia and perhaps less about their conferences and soundbytes. Also I agree Pacers could be better than 153s.